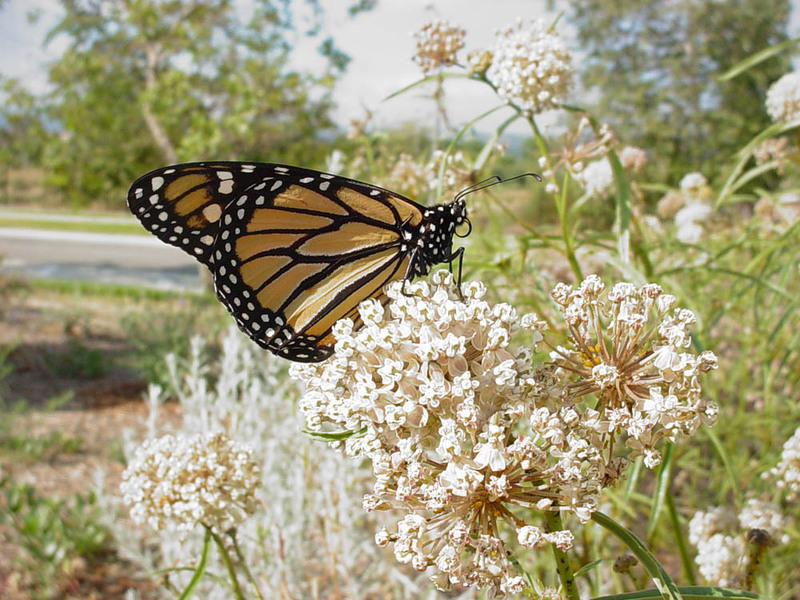 Many gardeners appreciate the special relationship between Monarch Butterflies and Milkweeds. Far fewer know the Milkweed species that are actually native to Los Angeles County. We’ve chosen the native Narrowleaf Milkweed as our Plant of the Month in honor of our annual Butterfly Month (July). With increasing interest in Monarchs, Southern California gardeners have flocked to the brightly colored ‘Mexican Butterfly Milkweed’, Asclepias curassavica, a yellow-orange-red flowered species from Central America. This Milkweed does indeed provide food for Monarchs. But it’s not native and it spreads like the dickens! Better to plant a local Milkweed to attract this favorite garden visitor. Local native Milkweeds add a touch of sophistication – and good butterfly habitat – to many local gardens. One of the more widely used is the Narrowleaf Milkweed, Asclepias fascicularis. This pretty, drought-tolerant native is blooming right now in Mother Nature’s Backyard. Milkweeds are grouped in the genus Asclepias, whose name honors the Greek god of healing. Many Milkweeds are used traditionally as topical medicines for sores and skin infections, even though they are considered poisonous plants (see below for more). Our local native species include the Narrowleaf Milkweed, Indian Milkweed (Asclepias eriocarpa) and Showy Milkweed (Asclepias speciosa). We currently have all three planted in Mother Nature’s Backyard. Narrowleaf Milkweed grows in summer-dry places below about 7000 ft. elevation in the western United States from Washington and Idaho south to Baja California, Mexico. Voucher specimens exist for the Dominguez Slough (now the Gardena Willows Wetland Preserve and the location of Mother Nature’s Backyard) and other local areas. 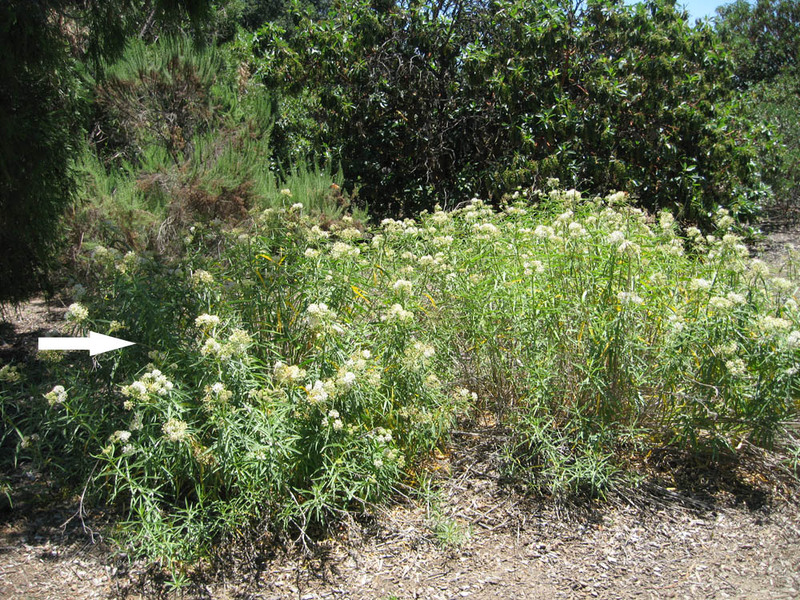 It grows in many California plant communities, mostly away from the immediate coast. Common to all are soils that are well-watered in winter-spring and dry with summer. 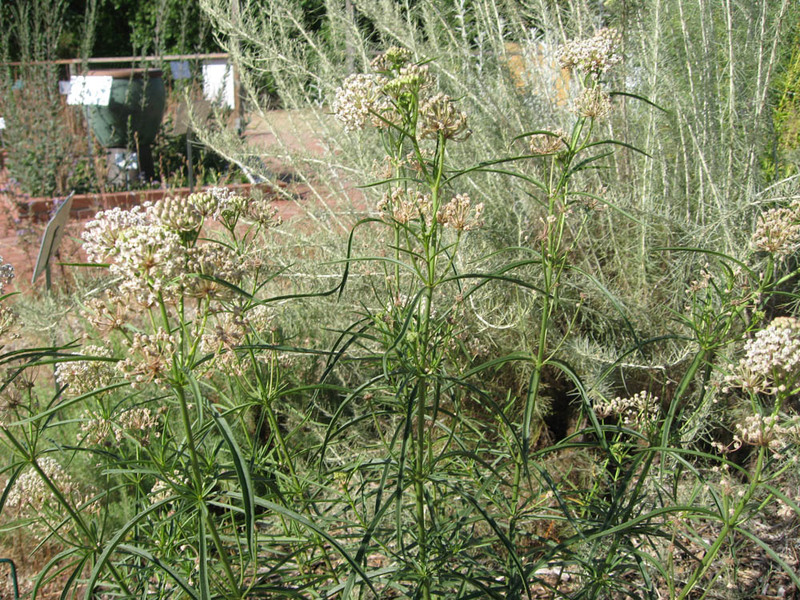 Narrowleaf Milkweed is an herbaceous perennial that dies back to the root each fall-winter. Plants have a deep, sturdy taproot that allows them to grow and flower during the warmer months. In our area, new foliage typically doesn’t appear until the weather begins to warm up in late April or May. The leaves of Narrowleaf Milkweed are long (up to 5 inches) and narrow, making this species more delicate appearing than other Milkweeds. The leaves are usually folded slightly along the midrib (the major vein in the center of the leaf) and arranged in whorls (spiral-shaped groupings) along the upright stems. The stems themselves are one to three feet tall and slender; a single plant will produce more stems each season. The overall impression of this plant is of a delicate, open tracery that complements many other types of garden foliage (see picture, above). The flowers of Narrowleaf Milkweed are a pale, creamy pink – a boon to gardeners who love pinks and reds. Like most Milkweeds, the flowers are grouped in ball-like clusters, which may contain more than 50 flowers. The individual flowers are small (1/4 inch; 1 cm.) and have a shape typical for Asclepias. Their unusual shape is due to fusion and modification of the usual flower parts. The five waxy pink petals (seen at the base of the flowers, below) are reflexed down when the flower is fully open. The pollen is stored as pollen masses (pollinium) rather than separate pollen grains. When a pollinator insect visits the flower, its legs slip into the slits between anthers on the gynostegium. If you look closely, you can see these slits in the picture above; there are 5, radiating out from the very center of the flower. When the leg is removed, it takes with it a pollinium, which is deposited into the stigmatic slit of the next flower. From then on, it’s fertilization as usual. For more on pollination see our ‘Planning for Pollinators’ post (June 2013). Given the unusual flower structure, you might expect pollination to occur only rarely. Quite the contrary: the highly modified structures, and the lure of sweet nectar, insure that Milkweed pollination is highly efficient. Numerous seeds develop within the narrow, sharply-pointed seed pods. At maturity, the pods split open, releasing the brown seeds with their fluffy ‘parachutes’. Wind deposits the seeds around the garden; so you may find new patches growing in favorable locations. Monarch and Queen caterpillars are hardy eaters, especially during their later stages. Milkweed plants can look a little ‘eaten’ by the end of the summer, but that’s a normal consequence of a healthy ecosystem. The caterpillars, which are well camouflaged, are also protected by chemicals produced by Milkweed plants. These chemicals, the cardiac glycosides, protect the plant from being eaten; they are toxic to many insects and larger animals, including humans. The caterpillars, which are immune to their effects, use these chemicals to deter their predators. 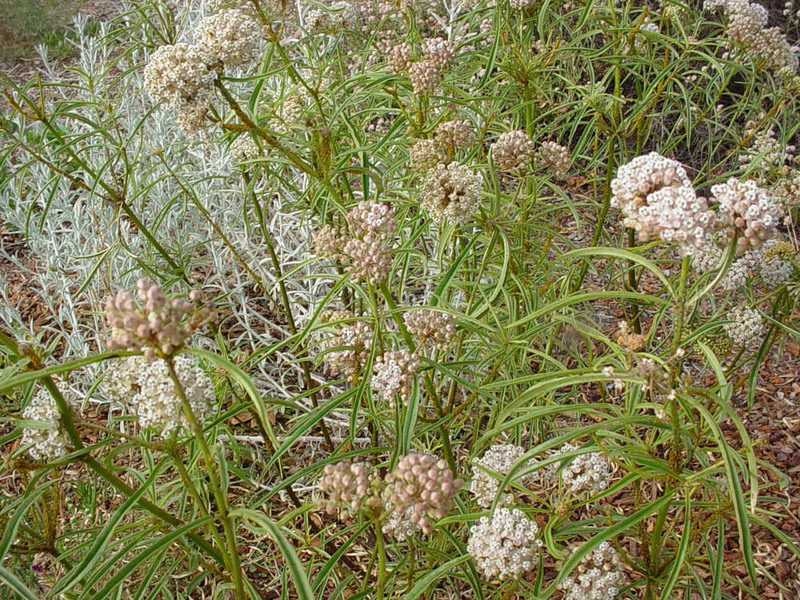 Native Californians used the Narrowleaf Milkweed in several ways. Parts of the plant were used to prepare topical (external use) medicines. Some plant parts – carefully and properly prepared – were even eaten. But caution is advised with any Milkweed; they do produce toxic chemicals. To be safe, no part of the Milkweed plant should be eaten or made into tea or medicine. Gardeners with pets or children with a propensity for eating garden plants should take this into account when considering Milkweeds. 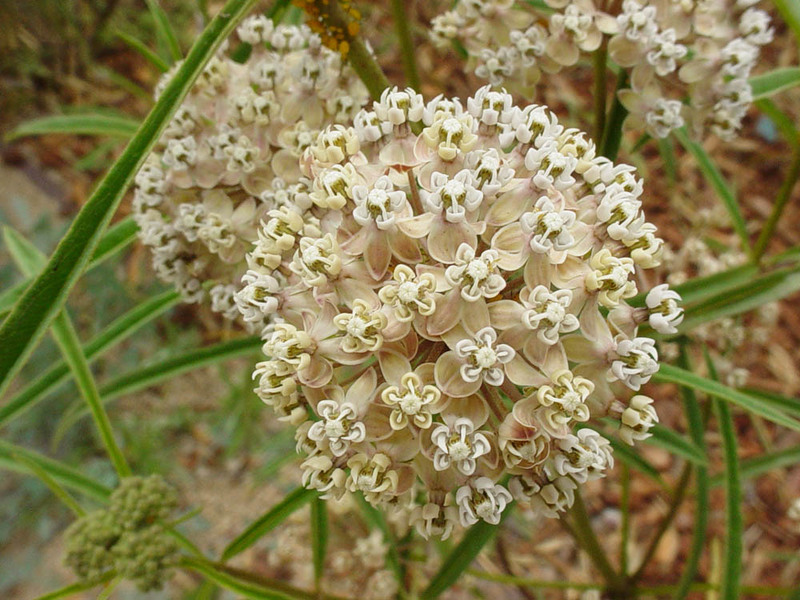 Narrowleaf Milkweed was also an important source of fibers for Native Californians. The dried stems were split and rolled on the thigh to release the tough fibers. These were then used to make string for nets, rope and other cordage uses (decoration on clothing, etc.). It takes a lot of Milkweed to make a net (hundreds to thousands of stalks)! Narrowleaf Milkweed is quite easy to grow. It does well in full sun to part-shade in most local soils, from sandy to clay. The plants like plenty of winter/spring moisture and can even tolerate winter flooding. But once established, they are remarkably drought tolerant. In our garden we treat them as Water Zone 2 plants, watering them occasionally in summer (see ‘Water Zone Gardening’ – posted April 2012). 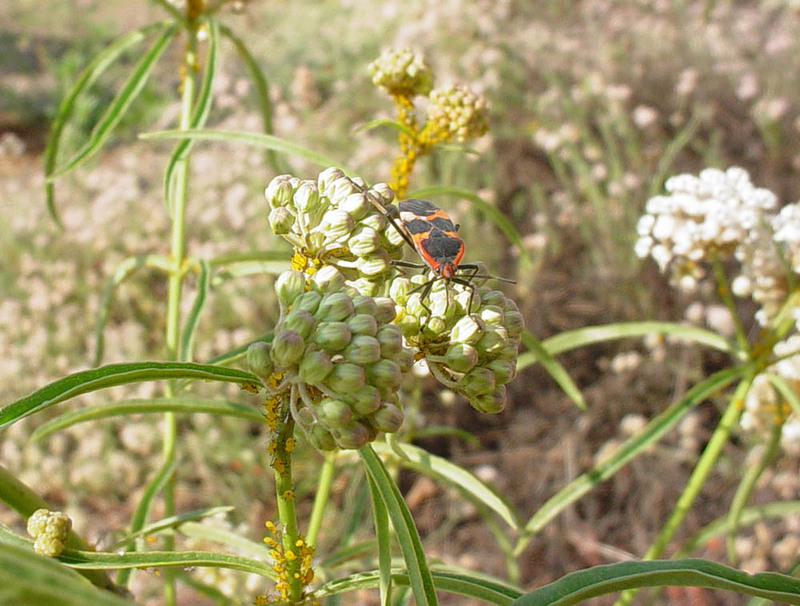 Overwatering Milkweeds can cause them to become invasive. As for many local native plants, we taper off watering in the fall (late August to October). This allows the plants to enter dormancy. Milkweeds should be cut down to 1-2 inches in fall. They will re-spout strong and healthy in spring. And that’s about all there is to growing Narrowleaf Milkweed. Milkweeds make a delightful addition to the home garden. Their foliage and pastel flowers provide a delicate old-fashioned note to the flower garden. They are a must for anyone wanting to provide Monarch and Striated Queen habitat. So consider adding some native Milkweeds to your garden. "Narrowleaf Milkweed is an excellent insect habitat plant." Truer words! I see so many insects on our narrow leaf milkweed. Not just monarchs! I grew hundreds of these plants from seeds in a greenhouse (more than 300). At least a hundred survived to be approximately 1 foot tall. I planted them in my garden with a 2' spacing in mid March of 2013. I live 1/4 mile from the ocean in Goleta, CA. The soil here is clay, but I'd brought in a lot of horse manure and mulch prior to planting. Also, I dug a hole with a post hole digger (maybe a foot or so deep) for each individual plant, and added some extra garden soil and a palm full of gypsum just prior to planting each Asclepias fascicularis. A monarch butterfly overwintering site is about 1/4 mile away from my house. Usually by mid March the bulk have migrated away, but nonetheless they ate pretty much all my plants in a month or so. A few came back the next year, and now, two and a half years later, they are back again. I'd spread a lot of wildflower seeds after the Monarch caterpillars decimated my milkweeds, which have also come back two years now. The Asclepias fasciularis remaining in my garden number about 35 or so. They grow amongst the wildflowers, but they are very small. The biggest one is probably 1.5' high if you stood it upright, and it has several stems, the largest of which is maybe 1/4" thick in diameter. The rest of the plants are smaller. Some only a 4" tall perhaps, and all with very narrow delicate leaves and stems. A queen or monarch caterpillar can (and do!) gnaw right though the stem, sometimes right at the base, thus effectively cutting them down. I had no flowers in 2013, and none in 2014. Spring of 2015 I had my first flower cluster, but by the time the flower buds actually opened, most had died away and I got two flowers total... out of about 35 plants (both on the same plant... the biggest one). What am I doing wrong? I'd love to see 3' high plants with big flower clusters like you have photos of above. Ultimately I'd love to get some seeds form them too. This year one local nursery is offering Asclepias fascicularis for the 1st time ever in this area. I purchased some for gifts at our homeowner's association, but I kept about six of them. Two I put in 1 gallon pots and four I transplanted (from the "4-pack" they came in to small 16 oz pots). I'm keeping these plants inside so far. As I recall from growing these in my now defunct green house in 2013, they are odd growers. Some become "floppy" and grow more horizontal than up. Others have problems with their leaves, which end up curled or mutant looking. Two of them seem to have a disease which makes the leaves look odd (and I see tiny webs on them, so I'm thinking spider mites?). I keep the aphids off of them, which is easy inside. A few look to be doing OK. Still, a plant like Asclepias physocarpa, fruticosa, curassavica or incarnata grows MUCH more healthy and strong looking (I raised one physocarpa inside, and them moved it outside, which is about 8' tall now!). I'd like to get some flowers and seed pods. Can I do that by raising them inside until they flower (the six I have there now?). Why don't my outside ones flower? Why do they stay so tiny and delicate... barely a days meal for a full grown caterpillar. "There has been much discussion about a recent scientific study (Satterfield et al., 2015). This research shows very clearly that monarchs breeding on tropical milkweed throughout the winter have higher levels of protozoan infection (caused by Ophryocystis elektroscirrha, OE) compared to monarchs in the migratory cycle. This result is not debatable"
I'm new to growing milkweed, but an L.A. native friend of mine starts her seeds in her greenhouse, plants the milkweed, and nets it for the first season. This prevents the caterpillars from chewing it down to the ground before it has the chance to grow. She trims it down to about 2" above the ground in ?November?, and then it's 2nd season she always has flowers. I'm growing milkweed for the first time. Hers is thriving, so, hopefully it works for me! First off I am a gardener, a grower of many things. I take knowledge I learned from one thing and apply it to the next, I also spend a lot of time observing what is happening. I tried to start my narrow leaf milkweed in used 6 pack flower containers last year - put about 150 seeds in them, and ended up with one plant ( I think three sprouts came up, of which I got one plant from). This year, borrowing knowledge from learning how to start my hot pepper seeds to grow with out a green house or heating pad, I put the seeds, one seedpod per pot, in pots with my milkweed plants I already had. I am too busy, with too many projects going on, and probably started my replanting and seeding late (as per information) in January/February. I live in mobile home park, that is on river flood plane/clay soil hell - I sure can't grow tomatoes here. So every thing is in pots, I'm trying to use 10 gallon or more ceramic pots (more stable). A narrow leaf milkweed seedpod has about 30 seeds, one the pots had 18 seedlings. I recently went to a local spring garden show, and saw the tiny asclepias fascicularis being sold $4. or so - they were about 2-3 inches tall. Bottom line, very had to start. Amazing to me, considering it this is supposed to be an invasive plant! Anyway my biggest plant is about 3 feet tall, lots of flowers, and hopefully - seedpods. My second best plant, 18 plus inches tall, has already produced 4 beautiful monarchs, and has 3 catapillars about to go to cocoons. I can't even begin explain how awesome this to watch, start to finish. To finish up, first, this is a native plant - it does not need a green house. second, it does not need amendment, gypsum or fertilizer. last, water accordingly to the plants needs, I do twice a week and will do so until plant starts to die back, then I will stop. This my first year with good success, not bad, since its only the second year of doing this! I hope this is helpful and/or inspiring, happy growing. P. S. I wrote this more out of frustration due to lack of information on this.